Water for irrigation | Infonet Biovision Home. Short description: different sources of water for irrigation, components of drip irrigation kit and othe small scale irrigation systems. 1) Deep ground water can be pumped from deep bore holes but is usually unsuitable for irrigation because of minerals in the water as well as high drilling and operational costs. to either elevated tanks from where water is gravitated to the fields, or water can be gravitated directly from the pump onto to the fields. Where the water source is situated at a higher elevation than the field to be irrigated, water can flow by gravity. A siphon pipe can lift water over higher elevated sections. v bucket irrigation is simply irrigating using a bucket with water. iv cutoff drains on fields. Water from macro catchments can also be diverted into ground tanks and earth dams. A common feature of all the shapes is that surplus water in the basins passes safely over their spillways and into the micro catchments situated further downstream in the field. 6) Spate irrigation is diverting seasonal flood water from valleys, rivers, riverbeds and gullies by gravity onto farm land situated at a lower elevation than the flood water. Some of the flood water in sandy riverbeds sinks into the voids between the sand particles where it replaces air, which escapes to the surface of the floodwater in thousands of bobbles making the floodwater look as if it is boiling. All structures are laid out on contours (horizontal lines) on the land which is ploughed and cultivated along these contours. Simple techniques of marking contour lines and graded lines as well as measuring vertical intervals and slope gradients are explained. 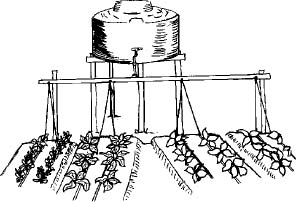 Schematic of a typical commercial drip irrigation system. In drip irrigation, water flows through a filter into special drip pipes, with emitters located at different spacings. Water is discharged through the emitters directly into the soil near the plants through a special slow-release device. If properly designed, installed, and managed, drip irrigation may help achieve water conservation by reducing evaporation and deep drainage when compared to other types of irrigation such as flood or overhead sprinklers since water can be more precisely applied to the plant roots. In addition, drip can eliminate many diseases that are spread through water contact with the foliage. Finally, in regions where water supplies are severely limited, there may be no actual water savings, but rather simply an increase in production while using the same amount of water as before. In very arid regions or on sandy soils, the trick is to apply the irrigation water as slowly as possible. Irrigation scheduling can be managed precisely to meet crop demands, holding the promise of increased yield and quality. 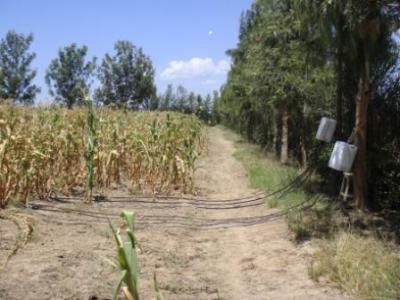 Expensive drip irrigation systems are employed in highly technical and industrial farming. The used systems are very expensive. Nevertheless, for a relatively low initial investment (US$15 to $85) a small-scale farmer can buy and set up a drip-irrigation system. 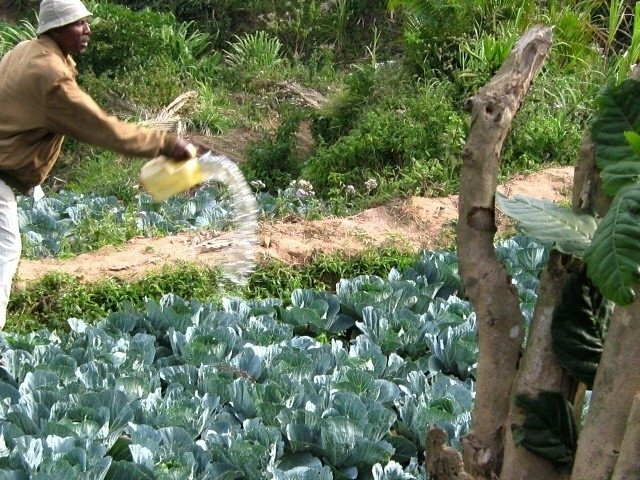 If used to grow crops for market, this investment will pay itself within the first season and lead to increased household food production, especially during extended dry periods. Drip irrigation requires little water compared to other irrigation methods. About 40-80 liters per day are needed per 100-200 plants. The small amount of water reduces weed growth and limits the leaching of plant nutrients down in the soil. In organic fertilizer or urine tea can be applied efficiently to the plants through the drip system. Disadvantages of drip irrigation systems are that most drip-irrigation equipment must be imported, so is not widely available. Furthermore, most experience in using drip irrigation is confined to commercial farmers and research stations. Drip-irrigation systems are subject to clogging, especially if poor-quality water is used. Farmers require training to manage drip irrigation successfully. For perennial crops, the drip hose should be lifted periodically if a drip hose system is used on the soil surface, so that leaves, soil, and debris do not cover the hose. If the drip hose is not lifted, roots can grow over the hose, anchor it to the ground, and eventually pinch off the flow of water. Leaks can occur unexpectedly as a result of damage by insects, animals, or farming tools. Systematically monitor the lines for physical damage. It is important to fix holes as soon as possible to prevent uneven irrigation. If the rate of water flow progressively declines during the season, the tubes or tape may be slowly plugging, resulting in severe damage to the crop. Once a month, flush the drip lines by opening the far ends of a portion of the tubes at a time and allowing the higher velocity water to flush out the sediment. The bucket system consists of two drip lines, each 15-30 m long, and a 20 liter bucket for holding water. Each of the drip lines is connected to a filter to remove any particles that may clog the drip nozzles. The bucket is supported on a bucket stand, with the bottom of the bucket at least 1 m above the planting surface. One bucket system requires 2-4 buckets of water per day and can irrigate 100-200 plants with a spacing of 30 cm between the rows. For crops such as onions or carrots, the number of plants can be as many as the bed can accommodate. A bucket system currently costs about Ksh 900 (US$ 15). A farmer growing for the market can usually recover this investment within the first crop season. The drum system is a combination of several bucket systems but modified to use a water supply from a 100-200 liter drum instead of a 20 liter bucket. It consists of drip lines measuring 15-30 m long, a lateral line to which the drip lines are connected (including a gate valve) and a drum or a small tank as the water reservoir, raised 1 m above the soil. The equivalent of five to ten bucket kits can be connected in this system. The lateral line is made of 2.5 cm (1-inch) diameter PVC, steel or polyethylene pipes. Connecting tees are used for each pair of drip lines. A drum system equivalent to five bucket systems can irrigate 500-1000 plants planted with 30 cm between the rows. Such a system requires about 100-200 liters of water a day, depending on the environment and crop. It costs a total of Ksh 5,000 (US$ 85). For comparison, a crop of cabbage yields a gross return of Ksh 15,000 (US$ 250). Bucket systems are produced by Chapin Watermatics Inc, 740 Water St, Watertown, NY 13601, USA, and are distributed at low cost. Bucket, drum, one-eighth-acre garden, and orchard kits are currently being promoted and available from the Kenya Agricultural and Livestock Research Organization (KALRO), Nairobi. 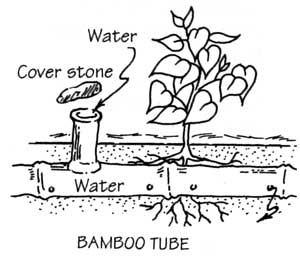 Instead of a PVC tube, also a bamboo tube can be used for drip irrigation. The bamboo tube is placed alongside the plants, with small holes in the tube near each plant. Water is put in the open end of the tube, either manually or using a bucket or drum, as described above. Pulsed irrigation is sometimes used to decrease the amount of water delivered to the plant at any one time, thus reducing runoff or deep percolation. Pulsed systems are typically expensive and require extensive maintenance. Therefore, the latest efforts by emitter manufacturers are focused toward developing new technologies that deliver irrigation water at ultra-low flow rates, i.e. less than 1.0 liter per hour. Slow and even delivery further improves water use efficiency without incurring the expense and complexity of pulsed delivery equipment. Drip irrigation is adopted extensively in areas of acute water scarcity and especially for crops such as coconuts, in container grown landscape trees, grapes, bananas, brinjal, citrus, strawberries, sugarcane, cotton, maize, and tomatoes. Drip irrigation systems may be manually operated or may be automatically operated by a controller with valves. Most large drip irrigation systems employ some type of filter to prevent clogging of the small emitter flow path by small waterborne particles. New technologies are now being offered that minimize clogging. Drip and subsurface drip irrigation is used almost exclusively when using recycled municipal waste water. Regulations typically do not permit spraying water through the air that has not been fully treated to potable water standards. Because of the way the water is applied in a drip system, traditional surface applications of timed-release fertilizer are sometimes ineffective, so drip systems often mix liquid fertilizer with the irrigation water. This is called fertigation. Fertigation uses chemical injector such as diaphragm pumps, piston pumps, or venturi pumps. The fertilizers may be added constantly whenever the system is irrigating or at intervals. Fertilizer savings of up to 95% are being reported from recent university field tests using drip fertigation and slow water delivery as compared to timed-release and irrigation by micro spray heads. In order to achieve an effective irrigation, unglazed earthenware or clay pots are buried to the neck of the vessel next to plants or small trees. The pots are filled with water and covered with a lid. Since the unglazed walls of the pods are porous, the water can seep slowly out and reach the roots of the plants. Instead of a clay or earthenware pod, also the sweet monkey orange fruit (Strychnos spinosa can be used when it has been dried and the top cut off. 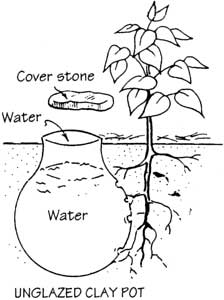 A filled, open bottle can be placed with its neck into the soil next to a plant, so it stands upside down. The dense soil hinders the water from leaving the bottle immediately. 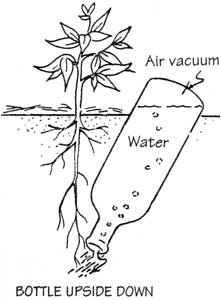 Instead, it gets released slowly and directly besides the roots, so it is available to the plant for a longer time and the water cannot evaporate directly. Clinton C. Shock (2006). Drip irrigation: an introduction. Malheur Experiment Station, Oregon State University. Available at www.cropinfo.net. Accessed on 30.03.2007. 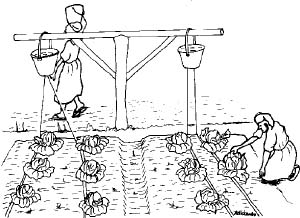 Wikipedia: Drip irrigation. Available at www.wikipedia.org. Accessed on 30.03.2007.